Bullsnakes average about 6 feet (1.8 m) in length, and specimens of up to 100 inches (2.5 m) have been recorded. This makes them among the largest US snakes, although generally not as long as indigo snakes nor as large in diameter as rattlesnakes. They are usually yellow in color, with brown, black or sometimes reddish colored blotching. The blotching pattern is as follows: large blotches on top, three sets of spots on the sides, and bands of black on the tail. Many color variations have been found, including albinos and white varieties. 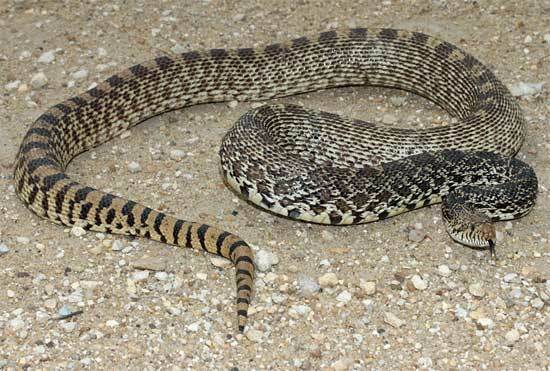 A scale count is required to distinguish juvenile bullsnakes from juvenile gopher snakes. Bullsnakes eat small mammals, such as mice, rats, pocket gophers, ground squirrels, rabbits, as well as ground nesting birds, birds' eggs and lizards. Juvenile bullsnakes depend on small lizards, frogs, and baby mice. Bullsnakes kill their prey via constriction. Though some bullsnakes can be docile, and with some time become accustomed to handling, most bullsnakes are quite defensive and known for their perceived "bad attitude". When threatened by anything as large as a human, a bullsnake's primary defense is to rear up and make it look as large as possible. They typically then begin lunging and backtracking at the same time in order to escape. Bullsnakes are sometimes mistaken for rattlesnakes and killed by laypersons. Due to its coloration, dorsal pattern, and semi-keeled scalation; the Bullsnake superficially resembles the Western Diamondback Rattler (Crotalus atrox), which is also common within the same range. The bullsnake capitalizes on this similarity by performing a very impressive rattlesnake impression when threatened. First, it hisses, or forcibly exhales through a bisected glottis, which flaps back and forth producing a very convincing "rattle" sound. It will also take on a rattlesnake-like "S-curve" body posture, as if it is going to strike. The bullsnake will commonly vibrate its tail rapidly amongst the brush or leaves, and flatten its head to make it take on a more characteristic triangular-shaped head of the rattlesnake. These defensive behaviors are meant to scare away threats, however, not sound an attack. In contrast to rattlesnakes, which usually keep their tail elevated in order to sound the most efficient rattle, bullsnakes tend to keep their tail in contact with the ground, in order to beat it against something to make a sound. Their rattlesnake mimicry is so impressive that it is sometimes the bullsnake's very undoing when discovered by humans. Bullsnakes breed in March and usually lay their eggs in April or June. They lay on average a dozen eggs in sand or other protected areas and leave the eggs to incubate unprotected. Clutches of 5-22 eggs have been observed. The eggs are elliptical, leathery, rough, sticky, and up to 70 mm (2¾ in.) long. The eggs typically hatch in August or September. Baby bullsnakes are 20-46 cm (8-18 inches) at hatching. Their color is grayish until after their first shed.